We are very excited to announce we’ve been working with Microsoft as an official partner of HoloLens, along amazing organizations such as NASA, Disney, Unity and Autodesk. The HoloLens was unveiled in January of this year. This device lets you bring virtual objects and scenes into your own environment, the best of both worlds between VR and AR. Our focus at Sketchfab has always been to provide the best way to publish and find 3D and virtual content, so when we first experienced HoloLens, it immediately felt like a natural fit and a great collaboration opportunity. 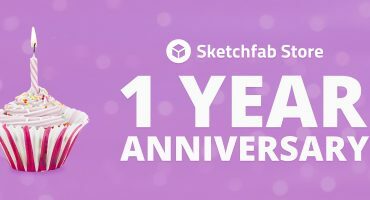 It was also a natural extension to Microsoft’s initial collection of printable files shared on Sketchfab for the launch of our download option. We got to try the HoloLens at an early stage at Microsoft HQ in Seattle, and have been impressed by the device capabilities so far. As part of HoloLens features, users can create content with their hands ­- a sort of virtual playdough­ – through the HoloStudio app. HoloStudio users can publish their creations to Sketchfab, and also import Sketchfab content to be reworked in HoloStudio. This is just the beginning of our collaboration with Microsoft. We can’t wait to unveil more of what you’ll be able to do combining a great device like HoloLens, with a platform like Sketchfab. Is it possible to connect HoloStudio to an existing SketchFab account (that’s not connected via MS Live)?